'Athene' Amaryllis produces enormous, gently-ruffled white blooms on sturdy stalks that open to reveal lime green centers. Paired with a lightweight terra cotta colored pot, growing medium and detailed growing instructions, Athene becomes a complete gift kit perfect for brightening someone’s winter. Easy to grow. Winter: 6-12 weeks after planting. To determine if a plant is sufficiently cold hardy, the USDA created numbered zones indicating winter low temperatures; the lower the zone number the colder the winter. If the coldest winter temperature expected in your area is -15°F (zone 5) then any plants rated zones 3-5 will survive the winter temperatures in your area. If you live in very warm winter areas (zones 9-11) plants with zones 3-4 ratings are not recommended. The lack of freezing winter temperatures do not provide a time for winter dormancy (rest). You have entered an invalid zip code, please check your zip code and try again. Ever grown an amaryllis inside the house? It's a snap. There can be rain, cold or snow outside, but all you do is water this "magic lily", and it zooms into growth. In just a few days, the stems arise, and in a few weeks the enormous flowers begin to open--huge lily blooms up to 8" across! (Our preplanted kit contains a bulb that will produce one or two stems, each with 3 or 4 flowers!) It only takes 6 to 10 weeks from first watering to full bloom and you'll have a big show for over a month. Note about Gifts: If you are ordering gifts that will require shipping to more than one address, please create separate orders for each address, since shipping for each must be recorded separately. Quantity Discounts and Corporate Gifts: If you'd like 25 or more kits, please call (877) 309-7333 for special quantity discounts on this product. Complete Instructions are printed on the back of the box. Place bulb so top inch or so of bulb sticks up out of the soil. Water very sparingly until the sprout is well out of the bulb. When first planted, place the pot in a sunny , and add "bottom heat" if possible. Many people do this by placing the pot on a radiator. Once the sprout appears, water regularly, but do not overwater. 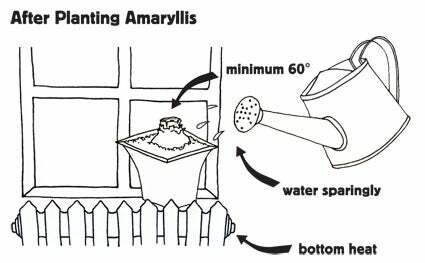 Overwatering is the quickest way to kill amaryllis. Your amaryllis will grow quickly and produce its spectacular huge flowers with minimal care. 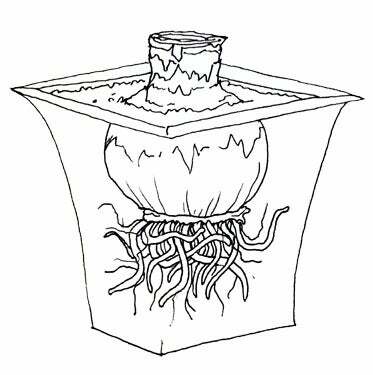 Remember to keep turning the pot regularly to make the stalk grow straight, as they have a tendency to grow toward the light. 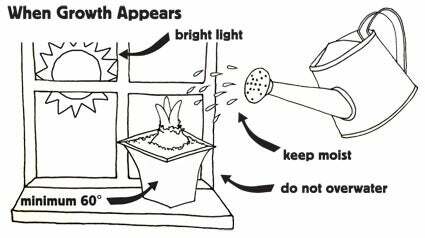 Once the bulb is flowing, it is best to keep the plant out of direct sunlight. Your bulb will produce several flowers on each stalk and most will grow two or three stalks. Remove each flower as it fades. Since these bulbs are tropical (native to South America), they can be grown beautifully outdoors in very warm and frost-free zones. This means from southern Georgia down through Florida, south Texas, and much of the Pacific coast. Planting time in these areas is usually September or October, and if the bed is well-cared for, the bulbs will stay in the ground and flower for years. If you'd like to propagate your amaryllis, our friends at Floridata.com have good Instructions. After winter bloom, if you want to rebloom your amaryllis, it's quite simple. When blooms fade, cut off the tubular flower stems near the top of the bulb, leaving the foliage to continue growing. Water as usual and apply water-soluble fertilizer every four weeks. Once spring arrives and frost is past, sink the Amaryllis pot in the garden in a sunny place. Continue to fertilize. At the end of the summer when frost threatens, simply pull the pot out of the ground, wash it out, and take it inside, and allow it to dry out completely in a warm dry place like a utility room. Once the leaves are dead and the bulb dry (usually 5 to 6 weeks), the bulb is ready for repotting. Simply cut off the dry leaves, and repot your bulb in fresh potting soil and start the growing cycle again. As soon as your order is placed you will receive a confirmation email. You will receive a second email the day your order ships telling you how it has been sent. Some perennials are shipped as potted plants, some as perennial roots packed in peat. The ‘Plant Information’ section describes how that item will ship. All perennials and spring-planted bulbs are packaged to withstand shipping and are fully-guaranteed. Please open upon receipt and follow the instructions included. Perennials and spring-planted bulbs are shipped at the proper planting time for your hardiness zone. Perennial and spring-planted bulb orders will arrive separately from seeds. If your order requires more than one shipment, there is no additional shipping charge. See our shipping information page for approximate ship dates and more detailed information. If you need express shipping or have any questions, please call Customer Service toll-free at (877) 309-7333 or contact us by email. Our shipping rates are calculated based on our actual average shipping costs. We do not seek to profit from shipping fees, so rest assured that our shipping rates reflect an average of what it costs to get our guaranteed products safely to your door. We charge one low flat rate for shipping our products even if your order requires multiple shipments. If you have any questions, would like to purchase expedited shipping, or have quetions about shipping to Alaska or Hawaii, please call us at (877) 309-7333.